BPA FREE: FDA compliant and made of food grade silicone which is odor-free, non-toxic, non-stick, safe, environmental and easy to clean. Apply to all people. PORTABLE AND CONVENIENT: Foldable design can help you save space; it is compact and lightweight enough to carry anywhere. 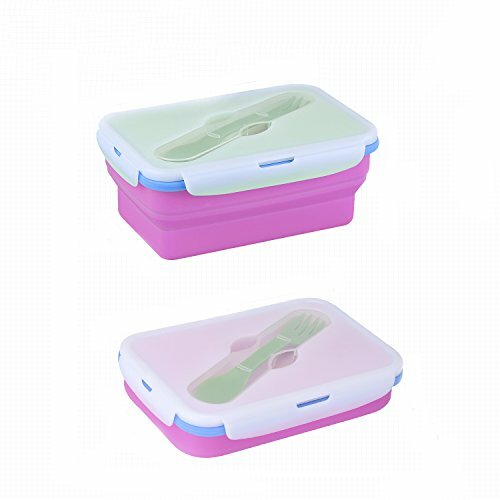 The lunch box also comes with the spork, it will convenient to you to enjoy your lunch. DURABLE TO USE: High and low temperature resistant, temperature range is -40 to 230 degree C / -104 to 446 degree F; you can fill all types of foods, soup and beverages. It is microwaveable, dishwasher and freezer safe. USED WIDELY: Great ideal for indoor food storage, such as meal, rice, fruit, vegetables, meat; or used as a lunch box in outdoor. Great ideal for office, camping, picnic, travelling, hiking, school.